Descriptive analysis creates metadata: data about your data. It explains what is going on behind the scenes and what created the figures you’re looking at. What has happened over time in the organization? What are your costs, revenues, and so on? What has changed over time to create the figures you’re seeing, and what can you do to positively influence these factors going forward? Data is never isolated - it results from a variety of interlocking factors and scenarios. While it can be helpful to view an individual piece of data, studying how it relates to other figures can give more insight on cause and effect within your organization. How does a change in one piece of data impact another? How does data react to different circumstances? 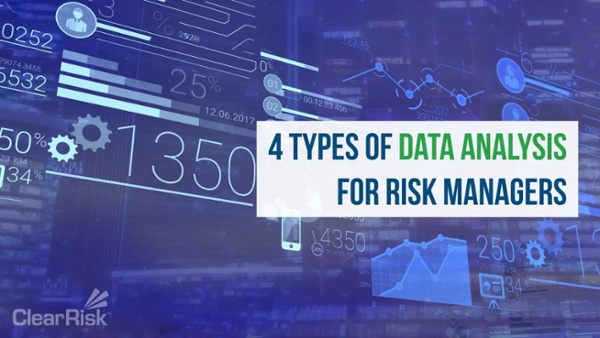 Answering these questions and understanding the details of your data can positively benefit your organization by saving costs, allowing you to prevent risks, and more. Trend analysis may be most important type of data analysis for risk managers. It allows you to diagnose what caused a situation and prevent it from reoccurring. It can also help you identify a link between seemingly unrelated incidents, preventing a claim. This will allow the risk team to implement mitigation strategies, create a more positive culture, and save money. While perhaps not a type of analysis on its own, visualizing other kinds of data analysis can be an extremely valuable process. Putting data into a visual form, such as a graph, allows you to immediately process what is going on. It's much easier to understand than a table or paragraph of numbers, and can be shared successfully with anyone in the organization. It can also identify patterns that might not have been easily spotted or provide new light to a tricky situation. The type or types of analysis that you should use really depend on the needs of your organization. Comparative analysis is helpful for organizations just beginning data analysis who are unsure what to do with the sudden wealth of information. Trend analysis is particularly valuable for those who believe their costs or incident frequency are too high, or those who are seeking to hold departments more accountable. ClearRisk’s Risk Management Information System takes all the guesswork out of all types of data analytics. Our report and dashboard functions facilitate the creation of any type of report within seconds, leaving you free to act on the results. Want more information? Editor's Note: This post has been edited with the addition of a video for comprehensiveness and accuracy.